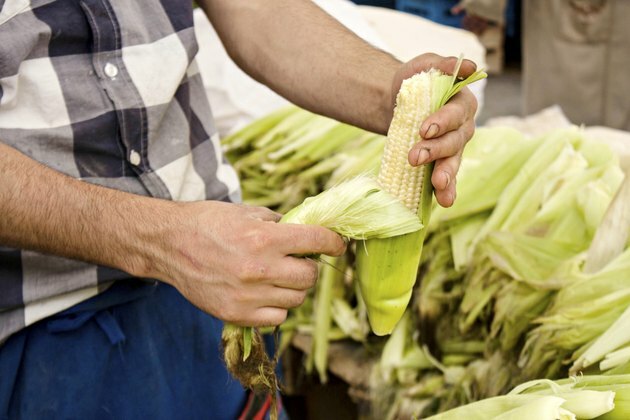 The husks of corn (Zea mays) break down in suitable conditions and produce a rich, moist compost. An annual plant, corn produces stalks, leaves, husks and corn cobs, and all these parts can be used in compost making, along with other fresh and dry plant debris and non-toxic, organic materials. The speed of the composting process depends on the proportion of ingredients used and how the compost pile is managed. Fresh corn husks supply the green material needed to create a fast-decaying compost pile. Compost piles require a balance of moist, fresh plant matter and dry, brown material to work effectively. Green corn husks, grass clippings, fresh leaves, pea pods, manure, fruit and vegetable waste, and similar ingredients supply nitrogen to the composting process. One part green matter to 3 parts dry, brown material is the ideal balance. Cottonseed meal, blood meal or chemical fertilizer can make up the shortfall if green ingredients are in short supply, but an excessive amount of nitrogen-rich material makes heaps wet, smelly and inefficient. Corn husks left to dry out and turn brown can form the dry, carbon-rich material for a compost pile. Shredded cardboard, dry leaves, sawdust, peanut hulls and wood chips are other brown ingredients suitable for composting. Newsprint is also acceptable providing it isn't glossy. Too much dry material in a compost pile slows or stops the composting process, but adding green material, turning the pile and spraying it with water usually solves the problem. Corn stalks and corncobs with the corn removed are high in carbon and break down slowly. Use these only as a brown ingredient, and chop stalks into 6- to 9-inch pieces before adding them to a compost pile. Corn husks in a compost pile can decay slowly or quickly. Most organic matter decays into compost if given enough time. Simply piling corn husks and other yard waste in a corner creates a cold, slow compost heap that might be ready to use in one or two years. To make a fast-decaying heap, mix brown and green materials in a 4- to 6-cubic-foot pile. When the pile heats up, turn it with a garden fork, moving the outside of the pile into the middle, and turn it again every three or four days. A sweet-smelling, brown, moist, crumbly material is the finished product of successful corn husk composting. A fast-decaying compost pile can produce compost in three to four weeks in hot weather. If a pile stops heating up between turnings, mix in 1 cup of 10-10-10 fertilizer per 20 cubic feet of compost. Correct a wet, smelly heap by mixing in shredded cardboard, and cover the heap with tarpaulin or other waterproof sheeting to protect it from rain. Compost loses nitrogen over time, so use fresh compost as soon as possible. Apply a layer 1/2 to 1 inch deep, and dig it into the soil, or soak compost in water for three or four days and use the water as a liquid fertilizer. How Long Do You Have to Age Chicken Manure to Use on Gardens?